Pavilions are free-standing structures in the natural or urban landscape. They are objects of pleasure. They invite repose, recreation, and relaxation. Pavilions are unexpected places that engage our senses and surprise us. They are destination points. Pavilions are ‘follies’ in French and English landscapes. People created and enjoyed Classical temples, grottoes (caves), waterfalls, wind towers, orangeries (greenhouses), tea rooms, stage sets, small amphitheaters, tree groves, treillage rooms, fountains, etc.. Urban pavilions are also wind towers, farmer markets, information kiosks, ticket booths, band shells, music stages, bike stations, cafes, theaters and more. Pavilions sometimes are temporary or in today’s language, known as pop-ups. Some pavilions are meant to be moveable and can be broken down and transported to another destination. Other pavilions are built as permanent structures and become part of a place’s heritage. Pavilions express the culture of the time, place, and climate. They attract visitors day and night and through changing seasons. Usually, but not always, they are open air. Larger pavilions have several indoor spaces, rooms, and even levels. While some pavilions are demure (quiet), others call out for our attention. Some pavilions are intimate spaces for one or two people while others hold thousands. Big or small, pavilions create a sense of place and pull people together. Prepare your imagination with pavilion power! Activity 1 – pavilion Power! 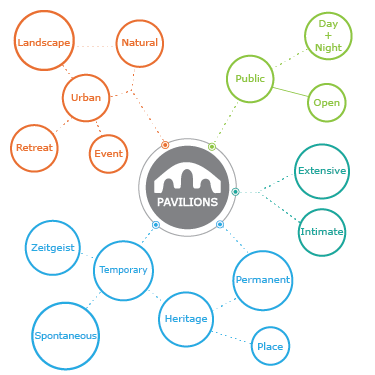 To get started thinking about pavilions, start with Word Webs, Mind Mapping, and Place Experience journeys. Create a word map that has the word pavilion in the middle. Make many other words for pavilions. Hint: There are already a lot of words in the introduction! Can you think of more? Secondly, let your mind wander. Think of your experiences. Can you remember any pavilion you visited? How did you respond? What was it shape or size or location? What did you do? Mind Map two or three places from your past. You can link your mind mapping exercise with Place Description and Place Experience to gather a lot of ideas. World expositions, starting with the London Fair in 1851, featured pavilions from different countries displaying technological advances and modern marvels. Pavilions reflected the times as much as the cultural character of the country participating. People from all over visited world’s fairs to see what other countries had and to see what the future might bring. Research world fairs and world expositions. Look at the character and construction of the pavilions through the decades. Pick five different pavilions and write descriptive paragraphs about each. Be sure to mention the year of the world’s fair, the architect of the pavilion, the character of the pavilion and the purpose of the pavilion. Make a World’s Fair Poster with a pavilion from five different Fairs. Sometimes pavilions are built in remote places. These pavilions hold a precious relationship with the beauty of the natural scenery. Often they serve as a resting point for travelers in the midst of a longer journey. Most times they offer shelter with a view. They often are quietly present, respectful of the setting and the views. Look for pavilions in the landscape. Reflect on the material choices and how the building is detailed. Consider if the design is biophilic or inspired by nature’s forms and structures. Iterate different relationships with the ground. Sketch pavilions on, above, in, and below the ground and see how the experience of approaching and entering and being inside are different from different elevations. 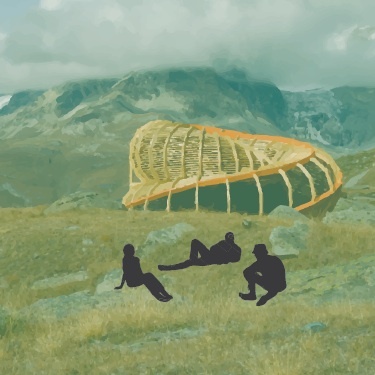 Try designing a nature pavilion based on nature! Pavilions in a city are magnets for attracting people. If they are works of art or interactive, they become phenomenal spectacles and contribute to the social and cultural life of the city. City pavilions are designed to express local or global heritage in contemporary ways, such as BIG’s Danish Pavilion for the World Biennale. 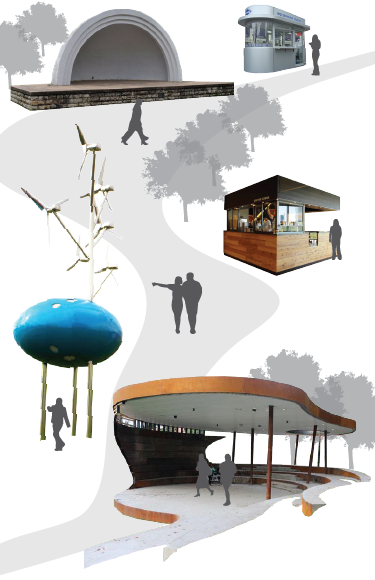 Pavilions in cities operate as social incubators or surprise destinations for new experiences. 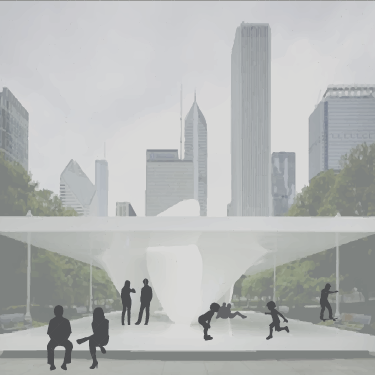 They can serve as celebration of festivals like the Burnham Pavilions in Chicago. Research contemporary pavilions and create a poster that communicates three different reasons for cities to build pavilions. Do you know of any pavilions in your city? You can look up your city on Google Maps using the satellite view and fly over places that might have a pavilion. These places include parks, courtyards, lakefronts, schoolyards, churches, etc. Pavilions are usually smaller than the buildings that they are beside. You can also ask people if they know of a pavilion. If they do know of a pavilion, get its location. Locate the pavilion on a map and arrange a visit. Take pictures and make a drawing of the pavilion in plan and perspective. Next, research it online and see if you can find out anything about its history. Who built it? When was it built? What is it used for today? Look at the Poster Journey. Pavilions give architects and designers opportunities to explore new materials, new lighting effects and new social interactions in the public realm. Research contemporary architectural pavilions. Consider your community, city or nearby countryside. Imagine a pavilion in one of these three settings and natural and artificial lighting sources for illumination. Word map possible activities, materials and views of this pavilion. Create three conceptual models of your pavilion on a Google Satellite Map image of where you would like to locate your pavilion. Consider your three alternatives. Photograph them and place them on a poster with your final design. Take pictures of your final model day and night. Draw in the surrounding environment to show your pavilion at its best! Follies are types of pavilions. Pavilions are destinations in the landscape. What featured pavilions from different countries? Pavilions can provide travelers a place to rest. Cultural pavilions can be performance places. Video Blark Ingels Danish Pavilion on Bike!